I am always prepared when it comes to making breakfasts coz Ajay is a very typical 'amchi' and prefers the usual idli-dosa-idiyappam rather than oats or cornflakes[we do have it once in a while though].Weekends are almost predictable with Puttu or Poori so throughout the week,I have many options for a healthy and nutritious breakfast. But sometimes I forget.There is no idli-dosa batter in the fridge or there is no atta or idiyappam flour or even eggs.Like today. I did have some stale bread in the fridge and what better way than to pep up stale bread than this upma!With some shriveled Capsicum and added tomatoes,it almost resembles a 'nutritious' breakfast! In a thick bottom kadai add 1 tbsp oil+ghee and splutter mustard seeds and urad dal.When the urad dal starts to brown,mix in the minced green chilly and ginger.Add onion and curry leaves and saute for 5-7 minutes or till the onions start to brown. Add the powders-red chilly powder,coriander powder and haldi powder and give a good mix.Add the tomatoes and capsicum now and sprinkle a few drops of water[if necessary] to avoid burning the powders.Add enough salt to taste. Now mix in the chopped bread and give a good stir.Mix well so that the masala coats the bread pieces evenly.Add the remaining 1 tbsp oil+ghee and keep the kadai on simmer till the bread gets roasted evenly.Stir once in a while to avoid burning.When the bread becomes golden brown and crisp add coriander leaves and switch off the flame. 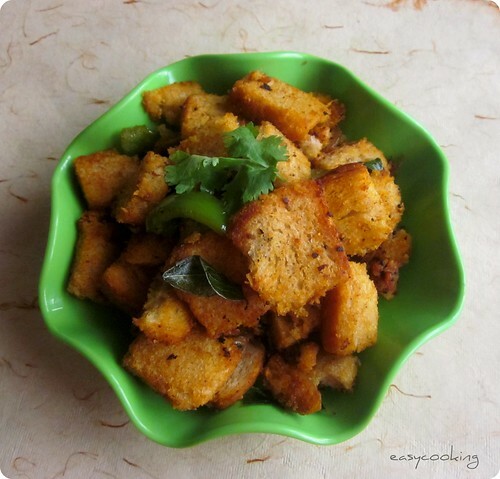 It is preferable to use a day old bread for this upma since fresh bread will crumble with all the mixing and will stay soft[and not crisp]after the cooking.I used whole wheat bread,white bread will work fine too. Though the ingredient list looks big,it is the usual ingredients found in your kitchen.I believe adding or subtracting a few ingredients here and there will not affect the taste in anyway.Go ahead and add anything to this if you like! On a different note,I baked a birthday cake for a 3 year old boy[our friends' kid]this week and though I was not very happy with the final outcome[lookswise],the cake was much relished by the kid guests as well as adults[there were 30 people in all].Thank you Ramya for trusting me with your kids' cake and for being more confident in my baking skills than I am! I baked a Classic American Layer cake,basically a Yellow Butter cake from A Passion for Baking and made a Classic Vanilla Buttercream from Savory Sweet Life.The cake by itself was a very tasty one,moist and with a tender crumb-perfect as a Birthday cake.Hope to better my decorating skills soon! Wowwww... looks so delicious and tempting.. cake is awesome and fabulous work dear..
Yum Upma! Are you kidding me, not satisfied with cake looks? 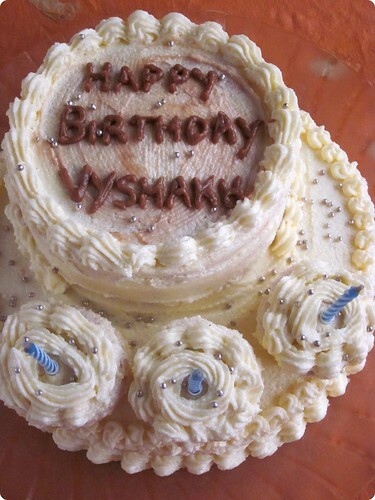 the cake looks soo beautiful and tasty as well. I have tried few of ur recepies and they all turned out well, especially the PBM. Love the crisp bread upma and the cake and what do you mean not pretty - it does look pretty. And was this a multi tier cake? Looks like it. Yummy and nutritious breakfast. The cake looks stunning and perfect. Your cake was appreciated by 30 adults and there kids then why are you feeling bad. You rock Divya. 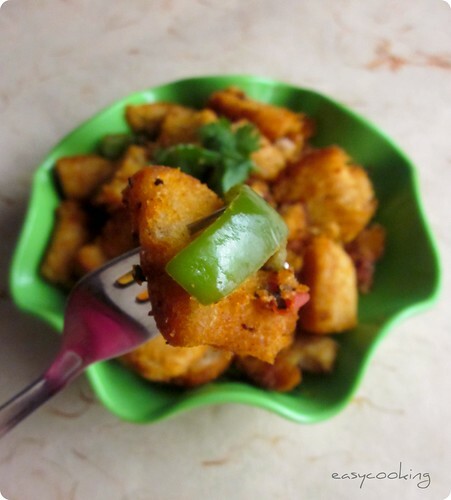 Bread upma with capsicum sounds good! And the birthday cake looks gorgeous! Loved its colour very much! Both cake and upma look good!! Made it and eating it while typing it.